Which Apps run on my Ti-Nspire CX? Runs on TI-Nspire CX CAS only. It does not run on computers! Enter the last 8 digits of your 27-digit TI-Nspire's Product ID. ID may look like: 1008000007206E210B0BD92F455 HELP. If this was your ID you would only type in BD92F455. At the end of the PayPal checkout, you will be sent an email containing your key and download instructions. 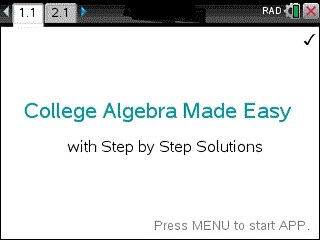 The Algebra Solver that shows steps – for calculators. The Algebra Solver covers the ENTIRE Algebra curriculum: Algebra, Functions and their Analysis, Trig, Geometry, Complex Numbers, Matrices, Exponential/Logarithmic Functions, Probabilities, Combinatorics, Sequences, Induction, Sigma Notation, etc. Users have boosted their Algebra knowledge & grades. Ideal when solving equations in Algebra classes as well as classes such as Trigonometry, Calculus, Physics, Chemistry, Biology, Discrete Mathematics, Geometry, Complex Numbers. Easy to use. Just plug in the equation or numbers and the algebra solver will solve and show steps. Euler Number as Limit Definition. and much more that is needed for Algebra..